There has been a recent spate of articles calling out brands whose ads have appeared on political websites, sometimes event inadvertently funding terror or hate groups. This should never happen. So how has it been happening? Brands are paying a lot of money to have agencies place ads for them and since this issue keeps cropping up, something is clearly broken. Accusations have been levelled at YouTube, unscrupulous advertisers, and shady programmatic advertising practices. So who is really at fault and what should agencies be doing about it? This issue became newsworthy as the line between brands and politics became blurred during the recent US election. The ripple effect has become a tidal wave, and brands are being affected globally as consumers are taking cues from the US and aligning their shopping habits with their personal and political beliefs. A pair of jeans isn’t just a pair of jeans anymore, who made them? Who owns the company? Where is the company’s money going in the political arena? All this matters to consumers now. Public opinion in a heated political climate can make or break a brand. Advertisers have been quick to react to their customer’s political leanings by donating money to certain causes and groups, boycotting merchandise, or taking a stance on government policy. Many brands have been caught off guard when their image has been tarnished by appearing on sites that don’t align with their political or brand beliefs. Sleeping Giants, a Twitter account that names, shames, and encourages consumers to call out brands for appearing on hate sites, has witnessed an unprecedented following. Consumers have been quick to condemn and boycott brands that are found wanting in their political leanings. The claims of ‘we had no idea’ ring hollow when ads appear on Neo-nazi websites or under ISIS videos. Brand managers, advertisers, and agencies are expected to do their due diligence before the company’s logo appears on a terrorist or hate group website. There has been plenty of hand-wringing and finger-pointing, but the truth of the matter is, from a programmatic viewpoint, it’s preventable. The underlying issue is that RTB programmatic buys an audience, and it’s easier to reach people where they appear online rather than targeting specific sites. There is also the problem of fraudsters pretending to be legitimate sites and bypassing Google’s controls, but in the majority of cases, it’s simply down to inventory that has yet to be classified, or a site not declaring their URL. Where advertisers can run afoul of their clientele is that by not bidding you could lose up to 30-45% of your inventory options. Unknown inventory isn’t always the proverbial ‘bad guy’, it’s just uncategorised. Google isn’t able to keep up and categorise every single site by the time bidding occurs, and not all sites have adequate content to be classified. Even given the speed at which programmatic buying and selling takes place, there are steps that can be taken to make sure your (and your clients) are protected from landing on dubious websites. Tools exist that provide pre-bid ad-verification, which intercepts the auction, and, based on data passed during the ad call such as, the publisher’s ID, the site ID, or publisher’s site URL, will prevent the buyer from bidding all in a matter of milliseconds. This also taps into third party ad-verification providers who have databases of unsafe sites that are constantly updated, doing the heavy lifting for you so that you don’t have to manage the process manually. DoubleClick also contains preventative measures to protect clients from ending up on nefarious sites. DoubleClick categorises websites when they receive ads and can quickly scan the site for words or URLs that are problematic. It also will exclude categories of websites when problems are found. Post-bid, if your ad slips through the cracks and lands on an unwanted site, ad-verification partners can help by preventing your ad from showing. This means that while your ad still lands on the page, it will serve a white box that protects the brand’s ad from being seen by users if it detects unsafe content. While this is far from perfect, since the client is still paying to end up on this site, the good news is that their brand is protected from being inadvertently associated with something that in this climate could, quickly and negatively, impact their reputation. Finally, advertisers and agencies can be more proactive by creating exclusion lists which they are consistently reviewing and updating. When it comes to deciding between building an in-house digital team or outsourcing activity to an agency the question remains; is there really a best practice? While there are no hard-and-fast rules, we’ve included some suggestions that can help you decide where you want to invest your resources. Some industry experts suggest that whether you outsource or keep work in-house depends on specialisation – the more specialised the work, the better it is to outsource. The logic behind this stems from the high costs – or more accurately, the hidden costs, associated with hiring full-time staff: benefits, training, pension, and paid vacation. Outsourced agencies are often cheaper – they might charge more upfront, but they are not as costly as on boarding a new full-time employee. There is little overhead involved in terms of provisions. Another added benefit: the results are highly focused to get the job done. The downside to outsourcing? Agencies can have many clients and you might be on the bottom of their food chain when it comes to prioritising who gets the most attention. This is why choosing the correct agency is fundamental to success. Internal teams can generally be cobbled together quicker and pulled off other projects to resolve an urgent problem immediately. But ultimately outsourcing is a great idea when you require a definitive and specialised strategy. When looking to run PPC activity it depends upon the life stage of your business and campaign size. Most companies start small, with in-house PPC activity but when it comes to trying to scale business growth campaigns begin to get too large and costly. At this stage, the company may be in a better position to afford outside agencies that can conduct efficient and cutting edge campaigns. A good outsourced agency will also develop close-knit relationships with their clients, becoming a veritable extension of the team and it only feels “out of house” by virtue of their location. Once a company is significantly mid-sized, it’s often better to outsource to a digital specialist, since they often have expertise that multi-channel marketers are lacking and don’t have the time to invest in. Large companies often split efforts between in-house PPC for smaller campaigns while passing off the heavy lifting and high-end campaigns to outside agencies. Sometimes in-house can run spend into the ground because they don’t have the in-depth knowledge or scope to absorb new technologies or techniques as efficiently as possible. The general consensus is that Display activity is better outsourced than held in-house. Why? It’s too specialised and would require a trained individual, fully immersed in Display activity for it to be viable, as they need to provide accurate attribution, and assessment activities. Most small companies rely on having a ‘Jack-of-All-Trades’ marketing person dabbling in PPC, Social, SEO and Display. For bigger campaigns, it’s best to spend the money and get a specialist who really knows what they’re doing, has the time to run campaigns across several channels, and the time to devote to using a multitude of tools. Social is like PPC in that, depending on your situation, the pendulum can swing both ways. The basic break down is this: Paid Social should be outsourced, Organic social, kept in-house. If the company is relatively small it’s best to save money and keep activity in-house. Paid Social has moved well beyond just occasionally “boosting” posts. It now has a vast array of complex, time-intensive, targeting techniques that might be best handled by specialists who won’t waste precious ad-spend targeting the wrong group of people, and who can also quickly, and correctly analyse data for the next campaign. Lastly, a benefit that cannot be overlooked is an outsourced digital agency’s ability to deliver a fully integrated approach. Outsourcing doesn’t have to be siloed into just one area. In fact, a cross-channel digital strategy is far more effective. Integrating your strategy means that campaigns results can be deduped for higher accuracy, advertisers gain a better understanding of the customer journey, audience lists can be built and used in retargeting across channels, and it is easier to deliver a full-funnel approach. If you’re looking to scale business growth and run integrated digital activity in a quick, efficient and cost-effective manner, a digital agency already has the capacity to hit the ground running with a workhorse of a team behind them. While you read this, hopefully you are already reveling in what a successful festive period you’re having and looking forward to maximizing a very significant sales period, even with the rise of Black Friday. For industries outside of retail such as travel and home, this also indicates the peak of the year increasing in wider online prevalence. So what can we expect from the Boxing Day/January sale? With the 27th also a bank holiday in the UK, it’s likely we may see a slightly quieter day than normal due to consumers also having the 27th to shop. This is a trend that we saw reflected by many of our clients last year, and is something to keep in mind. With the first Sunday of the year being the 1st it will significantly change the buying patterns of customers. We’d normally see a very strong first Sunday, especially in the home and travel sectors, but with this being the 1st we expect to see sales more evenly distributed. This will still be a strong period for both sectors, but there will need to be flexibility in the way you work, as what we’re currently seeing in buying patterns and product choices from customers may vary. A change in store behavior? Could this be the end of the mad Boxing Day rush in-store? With parliament discussing whether stores should be forced to close on Boxing Day, this could see massive gains for online retailers, with more customers shopping from a mobile device or desktop in the comfort of their own homes, and a potential shift in how companies split their sales items between store and online. Similarly to the run up to Christmas being impacted by Black Friday, there are a lot of external factors in when public holidays fall, the state of the market, and how this will impact consumer behaviours. Expect to see the sales trends from last year vary both in when they fall, but also in the products ranges being purchased. #12DaysofStrategy: How does Christmas on Sunday Effect Shopping Behaviours? Christmas falling on a Sunday leaves an entire day free for last minute shopping, sometimes referred to as “Panic Saturday”. In addition to this retailers may also see instances of showrooming, whereby a consumer sees an item in-store but completes their purchase online, sometimes at a lower price. A typical consumer experiences a digital touch at some point along their journey to an in-store conversion. Hence, to make the most of this year’s Panic Saturday on Christmas Eve, retailers should consider how they can best leverage their digital channels to drive in-store conversions for last minute shoppers, and also ensure that they are prepared for showrooming consumers to make their purchases online following an in-store visit. For last minute buyers in the run-up to Panic Saturday, information such as click & collect deadlines, and store information such as locations and opening times are necessary. Both sitelinks and location ad extensions can help with this and drive a consumer from visiting your retailer online to in-store. On Panic Saturday itself, local inventory ads will be imperative in creating a digital storefront and enabling a user to find the exact item they want, and then driving them to your store. Again, location extensions are important; search queries involving “near me” have historically peaked over the Christmas period, and so the easier a consumer can find your store, the better. For showrooming consumers it is the use of singular marketing messaging across your channels which will create a consistent user journey. Being the opposite of in-store last minute buyers, this presents an opportunity to use sequential messaging for showrooming consumers to increase brand affinity and conversion rates. Even with two categories of consumers that we can potentially expect on Christmas Eve, the common thread between these consumers is the importance of mobile devices. Last minute shoppers will be using their phones to find stores which stock the items they want, or store information such as directions. Showrooming consumers can be conducting their online research on the go using their mobile devices and may make their online purchases on the spot. Ensuring mobile websites are fully optimised to capture this traffic and serve the user the most relevant information will be important in order to make the most of this peak for retailers during the festive season. Hopefully these tips and insights from cross-device performance and cross-channel attribution post-Panic Saturday can enable retailers to make the most of Christmas Day falling on a Sunday, and increase revenue between offline and online activities. Stay tuned to more from our ‘12 Days of Christmas Strategy‘ blog series. #12DaysofStrategy: My holiday sales aren’t where I want them. How do I fix this? We are almost half-way through December and the Christmas shopping season is well under way. The digital marketing strategy for the festive period has been implemented and we will now begin to see indicators of whether it is paying off… or not. We all hope that analysing trends and lessons from previous years and developing new, clever ideas to reach shoppers in a different way will maximise sales. However, people are unpredictable and consumer behaviour changes all the time. Therefore, it is rare that campaigns go exactly the way they were planned, and in some cases, sales may be behind where we want them to be. If this is the case, do not panic; the holiday shopping period is not over. It is time to delve down into the details of the campaigns to identify exactly what is working, and what is not. The changes in the way consumers use devices in their path to conversion has been a topic of discussion across the industry for the last couple of years, both in the way we use different devices, and using multiple devices in the user journey. The ability to modify bids for desktop, tablet, and mobile separately on AdWords was not available this time last year. Therefore reviewing performance across devices on a continual basis is incredibly important, and could make a significant difference to campaigns. Do not only consider last click data when making bid adjustments. If possible, have a look at other attribution models to see if any devices are having an influence earlier on the path to conversion. Improvements in audience data and targeting by age and gender has been a focus of Google over the past year, most likely due to Facebook having this readily available for advertisers to use. With these features on paid search, not only are we able to target users based on their search intent, but we can overlay this targeting to hone in on the consumer most likely to convert. If you do not have many audience lists or demographics applied to your campaigns, set them up as bid only. Let the data build up on the lists over the coming days and weeks, then apply some bid modifiers to bid up where performance is stronger than the average, and bid down where performance is weaker. If you have been taking full advantage of these features, whether you are using bid modifiers, or have split out campaigns based on audience lists or demographics, review the data over the past couple of weeks. You will most likely see different trends from last year, or even the past few months, then adjust the bid modifiers where appropriate. It is often tempting to set up paid social campaigns and let them run. However, if you are not seeing performance where you would like it to be, demographics and devices are good places to start. This will provide insight into ages, genders, or devices to exclude from targeting due to poor performance, as well as indicate those which are driving the results so far. The granularity of campaigns on Facebook can depend on spend limits, with minimum advert set budgets specified by Facebook. However, if you do have some budget to play with, explore the option of splitting your advert sets out further by device or demographics. Take a look at the data you have so far, and break out the advert sets by whichever segment sees the largest variances in performance. This more granular structure will allow poorer performing audience segments to be identified more easily in order to channel more spend into the top performing areas. With a couple of weeks of data for December, this is the perfect time to review the time of day and day of week bid modifiers applied to paid search campaigns. Ensure all campaigns have hour of day segments applied, then bid up or down based on the performance of the campaigns at the different times. For Facebook, if activity is limited by the budget and lifetime budgets are being used, advertisers have the ability to turn activity off by hour. Segment the performance stats for advert sets by hour and day to identify if any hours can be turned off due to poorer performance. This will allow budget to be channelled into top performing times of the day. The middle of the holiday season is not the time to make any major changes to the structure of shopping campaigns; however there may be some adjustments which can help to improve top line performance. Drill down into each product group, and break out both the products which are driving sales and those which are spending the most. This will allow bids to be adjusted at a more granular level. Decrease bids on the products which are spending a lot, but not generating the desired return. Increase bids on the products which are performing well, but do have impression share maximised. It is the task which many of us want to put off, however search query reports for paid search are key to ensuring budgets are being spent as efficiently as possible. Make sure all the irrelevant search queries are excluded from campaigns. Pull these reports on a regular basis as there are always new queries. Add any search terms which are driving sales through non-exact campaigns into the account as exact match. This will allow you to keep an eye on these keywords, and manipulate bids on them specifically. For paid search campaigns, review the keywords in each ad group to make sure they are all closely related. If there are any which are not, split them out into a new ad group and amend the ads where possible to contain the keyword. This is to ensure that your ads are as relevant as possible to the search terms they appear for, which will help improve quality score. As a guide, we recommend a maximum of five keywords per ad group. If there are any more than this, the ad group will likely benefit from being split out. It is not only ad relevance in paid search which is important; users also need to be served appropriate messaging, and this applies across all digital marketing activity. It is easy to fall into the trap of running with ad copy which is familiar to us as advertisers. It may have performed the best in the past, but on-going testing is crucial to a successful campaign. Often, we are limited by both promotional messaging and character limits, therefore testing does not need to be anything drastic, and during peak sales times it should not be. Test one section of the ad, whether it is the headline in paid search ads, the image in Facebook ads, or the call to actions. Make sure the unique selling points which differentiate you from competitors are highlighted. If you have some tests up and running already, now is the time to review the results. Think carefully about which metrics are most important to your goals, then pause the ad variation which is lower performing, and set up a new test for the coming weeks. If you do not have any tests running, get some set-up. The ad variation feature released earlier this year in AdWords is a great way to do this quickly without having to create lots of new ads. It allows advertisers to simply find and replace in ads. If you are nervous about testing the unknown over such an important sales period, the tool allows tests to be run across a proportion of impressions, so set the test to only run on 20% of impressions for example. Hopefully, some of these tips will be useful for improving performance of both paid search and paid social campaigns over the festive sales period. As Christmas Day approaches, there is fierce competition in the retail industry to close sales. At the same time, users turn to researching online to find the perfect Christmas gift. Through their research, a user will come into contact with a variety of touch points where holistic marketing can support the users’ journey to conversion. Holistic marketing refers to the coming together of different marketing aspects. Syncing multiple digital marketing channels, including Programmatic Display, Paid Search and Paid Social activity can be used to create a seamless brand story to take the user through to converting. For example, a user may be interested in purchasing the latest smartphone for a family member this Christmas. Buying a smartphone is a considered purchase, requiring thorough investigation before commitment. There are also dozens of Phone Providers to could choose from, so why choose your brand? At the beginning of the consumer journey, the prospective buyer is likely to be interested in increasing their knowledge of this topic, and so the user may research phones online. Whilst doing their research they may find themselves on tech-sites and blog reviews to help them make their decision. As part of the phone provider’s Display marketing strategy, Display banners featuring messaging on the brand’s great range could be contextually aligned with the content on these sites. The call to action on the banners at this stage of the users’ journey should be more generic, opting for ‘Shop Now’ rather than ‘Buy Now’. After seeing the Display banner, the user may want to find out more about the phone provider’s range, and so continues their journey by searching for them on a Search Engine. This stage of the journey can be supported through Paid Search activity with an ad featuring Christmas messaging as well as messaging which compliments their Display banners. If a user clicks through to the website, then after acquiring the information they need, the user may continue their daily business to give time to digest the information. Later on, the user may go on one of their social media accounts. As part of the brands integrated marketing approach, the user could be retargeted with a banner through a Paid Social campaign which features information about the phone provider’s great Christmas offers relating to the phone they were researching. The call-to-action will now become less generic and more sales led. To complete the path to conversion, the user may click on the banner or make their own way to the website. By considering this holistic approach, the user will be provided with a seamless story across the marketing channels which ensures a strong brand message which can help the consumer make an informed decision and support the journey to conversion to ultimately drive sales for the brand. With Christmas just around the corner, brands are pushing for the last sales before Christmas day. This year the industry has seen online sales over Christmas have soared by 12% with many traditional high street retailers allocating more budget towards digital marketing and online advertising. With the rise of Amazon Prime, same day delivery and Click & Collect, Christmas shopping has never been so stress-free. Despite online shopping becoming more popular over the years, the market space has also become increasingly saturated and extremely competitive, especially around Christmas, the most exciting time of the year. Hence it becomes important for advertisers to be more strategic and creative with online shopping strategies. Preparing your holiday Google Shopping campaigns is almost the same as getting your high-street shop window ready for the festive season. A well-optimised feed with attractive item titles and stand out images will not only attract more customers to your site, but a smoother customer journey is also more likely to increase the conversion rate. Below are a few tips and tricks on how to get the most out of your Product Listing Ads this Christmas. Most of these are simple to set-up and a few hours of work will ensure extra sales from areas you haven’t explored before. If in doubt, ask one of the experts at NMPi. Google Product Listing ads are triggered based on how well the search term matches the product title and description. So, if your products fit into the gifting, partywear or festive food category then remember to include Christmas themed keywords in your product titles and descriptions so that they appear for the relevant search terms. For instance, if you’re promoting “stocking filler gifts under £5”, then remember to add this description to the relevant items in the product feed. The use of custom labels will help you categorise and subdivide the products in your feed which can really help with reporting and bidding. Assigning Christmas related Custom Labels will make bid management a lot quicker. You can save time by setting up rules and bid strategies, meaning that you can spend more time elsewhere. For instance, if you have novelty products that fit into the Secret Santa category, then label it with “Secret Santa” and push the bids up for products within this category during the first two weeks of December when most people are looking for Secret Santa gifts. Query Level Bidding allows you to bid differently on different types of keywords and more specifically separate your product terms from your generics. Like traditional pure search campaigns, generic and product name terms convert differently as they are aimed at customers at separate parts of the sales funnel. To ensure the highest return on investment (especially with the high spends around Christmas) you want to bid higher on brand and product name search queries which are more likely to lead to a conversion and lower on generic prospecting terms. There are online tutorials on how to set this up, but the focus around Query Level Bidding is to get the priority setting, negative keywords and base CPCs set up correctly. Do you have an English feed, ship internationally and are already running Google shopping in the UK, US or Australia? Good news! Thanks to Google currency conversion, you can now target multiple countries using one English feed. This minimises the time spent on preparing another feed, and most important of all, you don’t need to make any changes to your existing website. Currency converted shopping takes minutes to setup and it’s the quickest way of getting your products in front of potential international customers when the intent to buy is at its highest. We hope you found these tips useful and will help you drive more online sales from PLAs this season. If you want to see more tips on how to run online Shopping campaigns, then please check out The Essential Guide to Google Shopping. With increased competition this year and Amazon’s ever-strong presence, advertisers need to be more intelligent with their budgets. This includes which keywords to bid on, which users to target, and the best times to increase coverage. This year, Google has enabled demographic targeting for search, and this article explores the opportunities it creates in improving efficiency this Christmas. 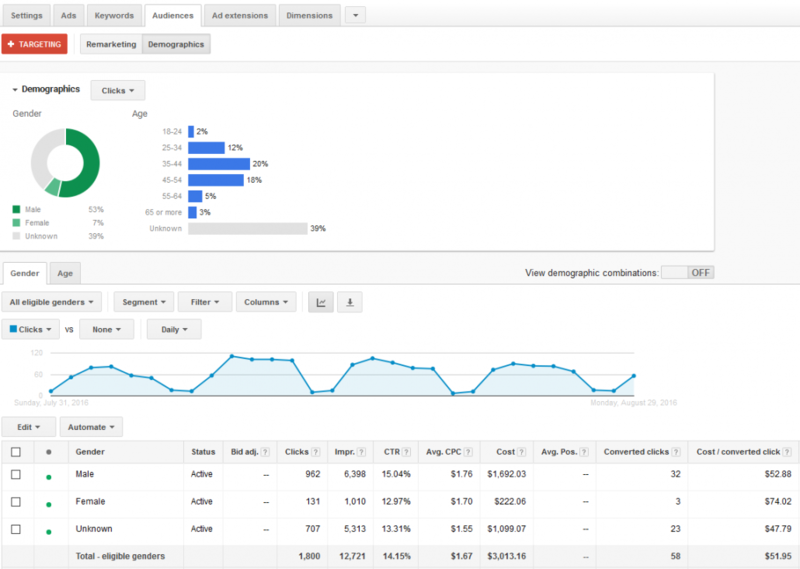 Using demographic bid modifiers, advertisers can now increase or decrease bids based on the user’s age and gender. This can be applied instantly to all ad groups, allowing advertisers to easily optimise campaigns, up-bidding where conversion rate (CR) is stronger and conversely, trimming bids where CR isn’t as strong to maintain CPA targets. Why not take your strategy one step further by targeting a single gender per campaign. This gives you total control over the budgets, keywords, and creative. For keywords around men’s products, include a ‘treat him’ call to action and vice versa for women’s products include ‘treat her’ messaging to enforce the spirit of giving. Test different ad variations to see if certain messaging has a stronger impact based on gender, for example, free gift-wrapping might appeal more to men. Expand this to your brand campaigns and trial sending men and women to different landing pages, e.g. send women to a ‘male products’ page at the time when gift purchasing is most prevalent. Run this as a test with the homepage as a control to review any potential uplift in CR. As stated in our blog #12DaysofStrategy: Making the Most Out of the Gifting Season, Customer Match is a fantastic tool for advertisers who collect data on gender in their CRM. Retarget to men who purchased female products last year (and vice versa), and use the messaging to remind them about your great service and USPs which led to that initial conversion. A commonly discussed hypothesis is that women do their shopping early, whilst men leave it to the last minute. Interestingly, looking at 2015 data for some of our clients (see graph below), we have seen the trend is very similar for both genders. The peak is around the third week of December, which then declines towards last delivery dates. Ensure you consider previous conversion data when making decisions on where to allocate the most of your monthly budget. To conclude, having a well-developed strategy for demographic targeting will not only help maintain efficiency in a more competitive market but will also allow advertisers to truly tailor their messaging to the most relevant audiences at the time they are most likely to convert. and last but not least for some retailers January Sales will begin as early as Christmas day. This is a lot to contend with, and social media channels such as Facebook, Instagram, Pinterest, and Twitter can be an excellent source to tapping into the holiday shoppers. In our Day 6 edition of our “12 Days of Christmas Strategy” series we are going to give you a few tips on how to make the most out of your Paid Social advertising strategy, and look at why it can be so beneficial for advertisers to be using these channels. When targeting on Paid Social channels, advertisers are able to target demographics with a precision not available on other DSP’s. On Facebook, for instance, users must state their gender on their profile, this makes it incredibly accurate to creative gender targeting campaigns. Furthermore, many users share details of their relationship status as well as members of their family. Consider targeting males who are listed as in a relationship the few days before Christmas. If they are in a relationship with a woman use messaging such as ‘Delivery available in time for Christmas day, buy her the perfect present today!’ And you can also target males who are listed as in a relationship with a man ‘Delivery available in time for Christmas day, buy him the perfect present today!’ We know that most of us are notoriously late shoppers, so creating a sense of urgency in your messaging will help to get them to convert. Look-a-like targeting is another very powerful tool available across many social platforms. If you have an audience email list of consumers who purchased previously, especially during last Black Friday and Christmas periods, consider using look-a-like targeting to expand your consumer base, and reach those who are most likely to purchase. Increasingly Boxing day sales are beginning online on Christmas day, with businesses taking advantage of the increasing number of people on their phones and tablets. Across data from NMPi campaigns last year, Christmas day sees a much larger proportion of sales on mobile than average. 56% of Facebook users reportedly only log into Facebook on a mobile device, with the remaining 44% logging in across both mobile and desktop. Therefore, with more people accessing social media sites such as Facebook on mobile device rather than desktop, it may be worth injecting spend into your social campaigns over Christmas day and optimising your ads to appear best on mobile. Hopefully, these tips will help you make the most out of your Paid Social campaigns this holiday season. Christmas is the most important time for many online retailers, and securing a slice of the gifting pie is essential to achieving targets. Therefore it is vital that advertisers do everything they can to plan their digital gifting campaigns to perfection. This article will help you make the most out of your Paid Search strategy. Ensure you have all your remarketing campaigns set up whether for Paid Search, Paid Social, or Programmatic Display. Make sure you are using all the audience lists you have available to capture users who have already shown an interest in your brand (Check out our post on ‘How to Maximise Audience Data‘). By simply overlaying remarketing lists and increasing bids for those who have visited gifting pages on-site, advertisers can boost conversion rates by up to 10%. There are clear gifting trends in December based on gender. We see that females tend to make their purchases earlier in the month whilst there is a definite spike in men’s purchases just a few days before Christmas. Perhaps, unsurprisingly, this reflects the different approaches to gifting for men and women. This should be reflected in an advertiser’s strategy by splitting gifting campaigns by gender and weighting bids for female consumers earlier in the month and men’s closer to Christmas. An exciting feature released earlier this year, for Paid Search campaigns, enables users to create and target (or exclude) user lists by uploading customer email addresses. It is ideal for a successful gifting campaign as it creates the opportunity to show different promotions to loyalty card members or use CRM data to cross-sell gifting products. For example, if gender is included in your CRM you can target males that purchased female gifts (watches for example) last year and retarget them with offers for other products (e.g. jewellery) as they browse for what to buy their loved ones this year. This strategy can also be used across Paid Social campaigns. The best products sell out quickly and can leave a considerable cost for advertisers who are unprepared. You may notice a product that had been converting well has altogether stopped selling. You go in and check and see that it is out of stock and you pause the campaign. By this stage it is too late, you have already cost yourself money and time. Therefore, it is essential, (especially around Christmas) that you have an “out of stock” script running hourly across your product campaigns. You can set it up to check pages where products are no longer available and alert or even directly pause the keyword in question. This will help use budget efficiently so that you can pause activity on any sold out products, and prevent wasted spend. Not everyone plans ahead and takes care of gifts for loved ones early so it’s important to highlight in ad copy the countdown to next or same day delivery, which can capture the last minute purchasers as well as creating an urgency to buy. Countdowns can improve CTR by 11% and are a given for a successful gifting campaign. Multiple gifts for family and friends mean that bargains are essential for the majority of consumers. As such it is important you are conveying your best deals to customers. However, it can be difficult to keep on top of the ever-changing offers-not to mention the suffering quality scores for every ad copy change. What is the solution? Ad customizers! With promotions laid out with start dates and end dates in the business data section in AdWords, add a simple dynamic reference in your chosen ad copy and you have ads that will change as (and when) your promotions do. You can even add countdowns into the end date to increase the urgency! The ad copy never needs to be altered, only the reference sheet and as such, your quality score is maintained even when the ad shown to users changes. Show the best deals to the potential customer, install some urgency in them with a countdown and save yourself money by lowering those all-important CPCs. Taking these insights into account should help put your gifting strategies in the best position to ensure maximum activity, and secure a portion of the festive feast on offer. If you found these tips useful, check out our other posts including, “How to Maximise Audience Data” or check in on Thursday for our next post in our ‘12 Days of Christmas Strategy’ blog series, “How Social Media Strategies are Effected by Christmas.” We will be covering more topics throughout the series so stay tuned, and follow our progress on Twitter with #12DayofStrat!